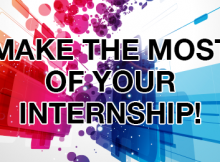 Internship program have become a must for university students. Without the work experience they offer, the post-graduation job search is much more difficult. But it’s not enough to simply get an internship. How will you be successful, stand out and get the most out of your Internship program as an intern? Here’s how to impress your employer during your time there. As an intern student, you probably won’t be doing glamorous, substantive work; you’ll likely be making other people’s lives easier. So you may get stuck photocopying, filing, arranging meetings, or doing other menial tasks. But in exchange, you’ll get exposure to the field and experience. When you come in as an intern, you’ll have to prove yourself in the workplace. To show that you pay attention to detail, follow instructions, and care about quality, do a great job even when you’re handed boring tasks. Eventually, someone may let you try something more interesting. Observe how others in the office act, and mirror that. If employees modulate their voices when others are on the phone, modulate yours. If they’re compulsively on time for meetings, you should always be on time, too. These details may sound trivial, but they’ll help you stand out compared to other interns. Don’t use social networking sites (unless it’s part of your job) or text with friends throughout the workday. You may be confident that it doesn’t affect your work, but experienced managers may feel confident that it does. And especially this early on, your manager’s opinion matters. In school, if you made a mistake on a test or paper, it only affected you. In many jobs, mistakes are much more serious. If you do make a mistake, make sure you handle it correctly. Don’t try to cover it up or make excuses. Own up and fix it. Then tell your boss it won’t happen again – and make sure it doesn’t. Every so often, ask your boss how you’re doing. What could you do differently? What could you do better? Are you meeting the goals of the organization? What about goals your boss has for you as an individual? Make it easy for her to give you response that will help you grow. And once you have that feedback, use it. Ask them about their own careers. How did they get into the field? What do they like about it? What do they find challenging? What advice do they have for you? Most people love to talk about themselves and will be flattered that you’re asking about their experiences. Best of all, it’s likely to make them want to help you. There’s no intern exception in the dress code, and yet interns sometimes go to working wearing flip-flops, ultra-low-rise jeans, visible bra straps, and worse. If you look like you’re dressing for class rather than a job, you’re signalling that you don’t take your job seriously. Dress for the part you want to play. Talk to co-workers about your career plans, and let them know you’re open to advice, both now and in the future. They can be helpful by sharing job leads, recommending you for a job, and suggesting various career choices. Most people are happy to help, but they might not offer if you don’t ask. Talk to your manager about what you’re getting out of your internship, and thank her for giving you the opportunity to work there. We all love hearing the occasional expression of appreciation, so don’t be shy about offering it. A simple expression of gratitude may even put you ahead of the pack. Make yourself more memorable to those around you and create a professional network of contacts to reach out to when you’re ready to find your next job. Invite colleagues to lunch. Ask them questions in informational interviews. Offer to help where you can. Observe the great relationship-builders in your firm and learn from them. Add everyone you work with on LinkedIn, because it will make an enormous difference when you’re looking for full-time work. Internship program is hard work. And doing only what’s expected of you isn’t enough to get noticed. You need to go above and beyond, from arriving on time to doing exemplary work, and make the most of your time in the organization.